New Jersey State operated camping facilities offer a wide variety of options for scenery and amenities for families with kids, and the more serious nature enthusiast who wants to get out and experience the wilderness. New Jersey camping at state operated campgrounds can be experienced at the Jersey shore close by beaches to the more rural campgrounds of western New Jersey with gentle rolling hills, and the Sky lands in Northwest New Jersey where you can escape the crowds and experience the wilderness and more mountainous terrain. 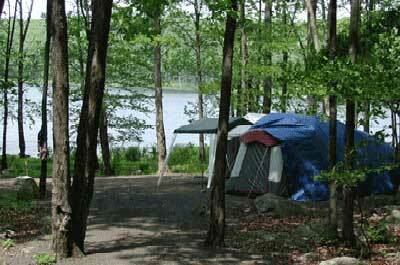 The New Jersey State Park System also offers many excellent camping facilities, many of which are featured on this site. With a wide variety of New Jersey camping facilities, and a choice of over 120 campgrounds and State Park parks to choose from, there is just about nothing you cannot do while you camp in New Jersey. Please note, alcohol is prohibited on NJ State Park Camping facilities..
25 miles north of Atlantic City and six miles west of Tuckerton. Open: Daily sunrise to sunset Day Use Area (Lake Absegami beach, picnic area, trails) 8 a.m. to dusk. A heavily-wooded pine barrens area with many sites spaced adequately apart from others. Fishing in the 67 acre lake is fair. Well maintained with clean bathrooms and hot showers. Campsites open all year. There are 176 tent and trailer sites and 6 group campsites open all year with water and pit toilets. For larger groups, there are 6 lake side shelters with two bunk rooms. Shelters are open April 1 through October 31. In addition to 6 lake front cabins open April 1 through October 31. There is a lake for swimming, canoeing, non-motorized boating, and fishing. Boat rentals are available in the park. Worthington State Forest features the famed Delaware Water Gap, one of the most scenic and photographed spots in NJ. Worthington is a great place for campers who love to hike. 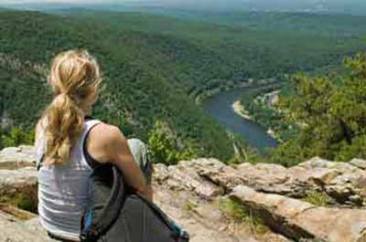 Hike to the top of Mount Tammany for an awesome view of three states. The trail has one of the largest vertical rises in NJ. It ascends 1200 feet in less than 2 miles. Be careful, this is bear country. 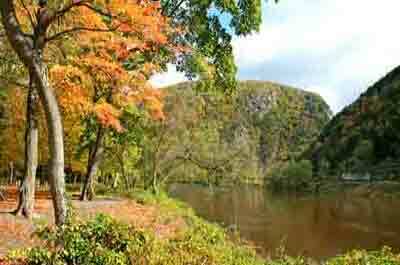 The campground runs along the Delaware River, north of the Delaware Water Gap. Most of the camp of the sites are open without much shade or privacy. There are 69 tent and trailer sites. Most sites have easy access to modern toilets and showers. 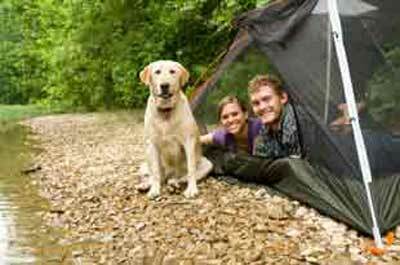 Primitive camping sites are available only for boaters and canoeists traveling from one access point to another. A section of the Appalachian Trail runs through Worthington State Forest. Hike the Old Mine Road along the Delaware River. This is a scenic route and is one of the oldest roads in the United States. 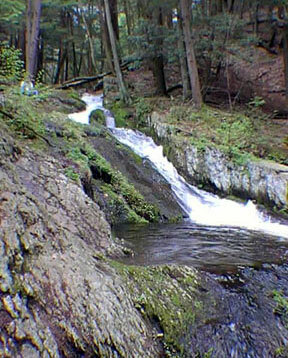 There are many other hiking trails that head up to the Kittatinny Ridge and the Appalachian Trail. Weekend ranger programs are given in summer. The activities include boating, canoing, fishing, electric & gas motors, trailer launch, car top launch. High Point is the highest pint in NJ at 1,803 feet is a scenic panorama of three states. High Point is a great place for campers who love to hike. There are 50 tent sites near Sawmill Lake with fire rings, picnic tables, and toilets nearby; 2 group campsites accommodating 25 to 35 people, open from May 15 through October 15. For groups there is one very large cabin available with a living room with a wood stove, full kitchen, two bunk rooms with double bunks, bathrooms and showers. It accommodates up to 28 people and is open from May 15 through October 15. The park offers interpretive and educational programs on a year-round basis with nature hikes, stream walks and talks conducted by the park naturalist. Swimming is available in the spring-fed waters of the 20-acre Lake Marcia. The beach is protected by lifeguards and there is a bathhouse and food concession adjacent to the beach. Boats may be launched at Sawmill Lake and Steenykill Lake. Power boats are limited to electric motors only. Fishing is excellent and can be found in High Point's many lakes and streams, which are well-stocked with native fish. Located in the Jenny Jump Mountain Range, this location features scenic panoramic views of the Highlands, Great Meadows, and the Kittatinny Mountains. The Summit Trail rises to an elevation of 1,090 feet. This location offers a nice combination of seclusion and the amenities of indoor plumbing. There are Twenty-two tent and trailer sites with fire rings, picnic tables, showers and toilets nearby. 2 group sites for up to 25 campers at one, and 40 at second site. 8 shelters with living room and wood burning stove. Showers and flush toilets are located nearby. Each accommodates four people. There is excellent shore line largemouth bass, sunfish and catfish fishing Mountain Lake with a car-top boat launch at Ghost Lake. Hiking: 11 miles of hiking trails and three miles of hiking /mountain bike trails with scenic views of the mountains. 67 tent and trailer sites with picnic tables and fire rings. Flush toilets and showers are within walking distance. Open April 1 through October 31. Hiking: The Highlands Millennium Trail, which will eventually connect the Delaware River to the Hudson River, is approximately 0.91 miles (one way) within the park boundaries. This leisurely hike is not ADA accessible. The park grounds and roadways are excellent areas for other strolling, jogging and biking activities. Open: Daily from sunrise to sunset. Stokes offers the camper, hiker, and fisherman awesome scenic views from the top of the mountain ridge to Tillman Ravine with its rushing stream and steep cliffs. For the less adventuresome who prefer not to hike the steep trail, you can drive to the pavilion at the top of the mountain. This is bear country. Please exercise caution. 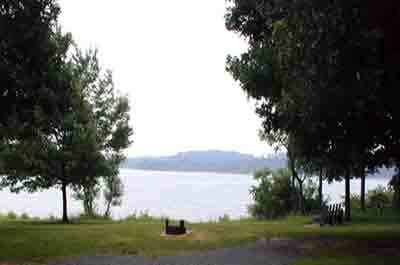 There are 51 tent and trailer sites with fire rings and picnic tables. Some camping areas available all year; 9 group sites open from April 1 through October 31; 9 enclosed lean-tos with a wood stove inside for heat. Open year round; 10 furnished cabins each with wood stove, refrigerator, electric stove; half-bath with toilet and sink. Each cabin accommodates four people. Open from April 1 through December 15; 16 group cabins that can accommodate twelve people. Open April 15 through November 30. >Hiking: A section of the Appalachian Trail runs through Stokes State Forest. There is also more than 33 miles of marked trails range in length from 1/2 mile to 4 miles. Wawayanda State Park is located in Northern NJ, along the NJ/NY border. You will find an extensive well marked trail network (over 60 miles) used for hiking, mountain biking, cross country skiing, and hunting. Part of the Appalachian Trail passes through the northern section of the park, heading you from the Warwick Turnpike, past glacial erratics, over Pinwheel's Vista, and eventually down to Rt 94 in Vernon. Hiking: Wawayanda State Park consists of over 60 miles of well marked trails. The trails are not ADA accessible. Along Wawayanda Mountain are outstanding views of the surrounding landscape. The 70-mile segment of the Appalachian Trail within New Jersey is maintained by the New York-New Jersey Trail Conference. 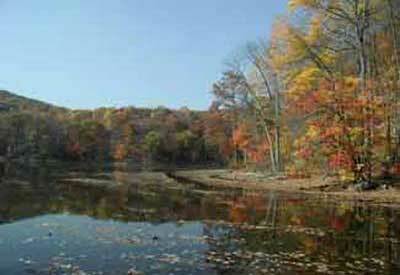 Wharton is the largest of New Jersey's State parks. It is a campers paradise for activities with many rivers and streams for canoing, hiking trails, miles of unpaved roads for mountain biking and horseback riding and numerous lakes, ponds and fields ideal for wildlife observation. It is also the site of Batsto Village, a former bog iron and glass making industrial center from 1766 to 1867 that currently reflects the agricultural and commercial enterprises that existed here during the late 19th century. 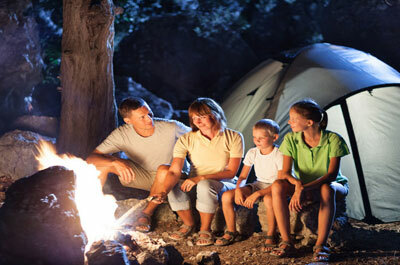 Campsites In the Atsion section, are open April 1 through October 31 with 50 tent and trailer sites. Water, flush toilets and showers are nearby. The Godfrey Bridge section has 49 tent and trailer sites, that are open all year. Primitive campsites are also available, some with with hand pumps for water and pit toilets. 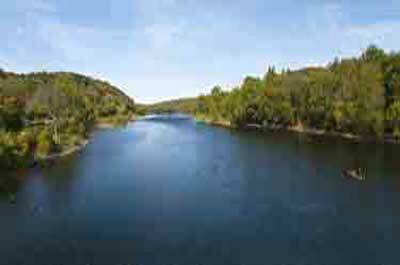 The Mullica River and Lower Forge areas can only be accessed by hiking, canoing or horseback. Mullica River is ideal for boating with electric motors, trailer launch, and car top launch. 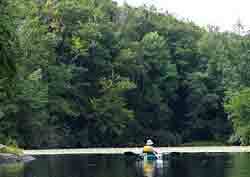 The Mullica, Batsto, Wading and Oswego Rivers are good spots for canoing and kayaking. Kayaks can be rented. Swimming is available at Atsion Lake, Wharton, Brendan T. Byrne and Bass River State forests.